Are you ready to consider purchasing a heavy duty dog crate because your pup escaped or destroyed his crate while you were away? Some dogs are perfectly comfortable and content in a traditional dog crate. However, there are other clever, energetic dogs that need an indestructible dog crate that is strong and durable while providing security and comfort. This article will assist you in determining the best heavy duty dog kennel to safely contain even the craftiest canine escape artists. Raising a dog is not easy, especially true for first-time dog owners. Some dogs can be quite uncooperative. Sadly, this can be due to poor training and also temperament. For this reason, it is essential to train your dog properly. Left on their own, puppies and dogs can get in a lot of trouble. It’s important to start obedience training early especially when your pup really wants to please you, and the best way to do that is to crate train. Crate training is in no way cruel or inhumane. Dogs have an inborn denning instinct that’s inherited from their ancestors, the wolves. They like to hide out in their own private enclosed spaces, making crate training, an ideal solution for a host of situations in the later stages of their lives. Dogs may have to be in a crate at some point for safety and security reasons. It may be while they are traveling or visiting the vet. A dog that has been crate trained will have no problem adapting to the crate, as opposed to one that isn’t crate trained. But, as important as it is to crate train, it is equally important to buy the right crate for your dog. How different can one crate be from another? After all, it’s just a crate. Wrong! Dog crates come in a variety of sizes, shapes, and types. If you do not select the right one for your dog, then it may be a waste of money for the pet owner. Size: The size of the crate is undoubtedly one of the most important factors to consider. The dimensions need to allow your dog to comfortably stand, sit and lie down with some extra headroom. However, do not select a crate that is too big or your dog may start to soil in one part of the crate and sleep in the other. Type of Crate: There are many different types of crates such as wire dog crate or a plastic crate. If you have a dog who is a bit of an escape artist or has a mischievous side to his personality, it is recommended that you opt for an escape-proof dog crate. They are tough, durable and will prevent your pup from escaping or destroying it. Durability. Durable material is an important element in the construction of a heavy duty dog kennel, so it is strong enough to safely secure your dog. Preferably, it should be made of steel or metal which is resistant to chewing and rough use. Consider purchasing a steel or aluminum dog crate that will resist rust and corrosion, as well. Convenience. Your dog’s crate will need to be cleaned. Look for a crate that has a pan that is easy to remove. Also, some kennels are constructed with multiple doors for flexibility. This is a nice option to consider. A heavy duty dog cage is not meant only for large or heavy dog breeds. It’s called heavy duty dog kennel because it’s unbreakable. Your dog will not be able to claw or chew his way out of it, no matter how hard he tries. And of course, it can house even the most powerful dogs. They are a perfect choice for most dog owners, irrespective of the size or the breed of the dog. They are typically a onetime investment and way cheaper than frequently replacing less sturdy dog crates if your pooch chews his way through it. Most of them are also compatible with airline travel norms, acclimatizing the dog to airline travel. Today, we take a look at the best heavy-duty metal dog crates. These have been handpicked on the basis of their features, their price and their customer reviews, making it easy for you to make the right choice. The popular ProSelect Empire Dog Crate is the number one choice in best heavy duty large dog crates category. This all-metal crate is virtually indestructible and will easily thwart any attempts to break out. It’s an escape-proof dog crate! Fabricated from 20-gauge strong steel tubing and reinforced by ½ inch diameter steel tubes, the crate is designed specifically to house powerful animals. The stout dual door latches and heavy-duty welding at stress points provide added security. The crate has a long-lasting, high-grade hammertone finish that is rust-resistant. To ensure easy cleaning, the crate comes with a removable steel tray. If you ever wish to move the crate, you have the option to use the four removable moving casters, which can be locked when not in use. What sized dogs can fit into this crate? Almost any large sized dog can fit easily into the crate. The crate itself is available in two different sizes (medium and large). The inside dimensions are as follows. There are customers who have housed their ridge-back lab cross dog, pit bulls, Labrador Retrievers and Akitas in the crate without any problem. Buyers comment that the crate is expensive, but may actually save you money in the long run. Additionally, it works well for the “high energy” dogs. They won’t be breaking out of this crate! Irrespective of whether you are a first-time dog owner looking for a cage for your puppy or a frustrated dog owner desperately looking for a solution for your dog who escapes, this will get the job done for you. It is durable, strong and almost indestructible. Go for it! Hot on the heels of the ProSelect Empire, we have another heavy duty metal dog crate with almost identical features. 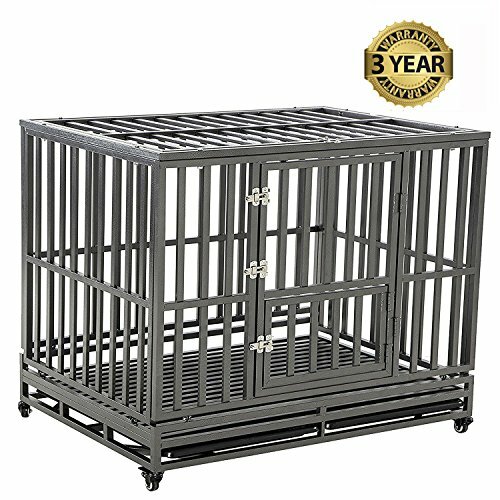 Lockup Heavy Duty Dog Cage is constructed of rugged steel tubing and has three doors for ease of use. This is an unbreakable dog crate. What sized dogs can fit into the cage? Pet owners love how the crate is so easy to assemble. Additionally, they like that it has three dogs which makes it easier to put their dogs in it. In a very few cases, some customers mentioned that the latches don’t line up properly. Otherwise, it is very durable and tough. Another great option! SmithBuilt is one of the most popular manufacturers of strong dog crates and this heavy duty dog crate is one of their flagship offerings. Available in different colors that are a welcome change from the norm, the crate is a sturdy and secure kennel for your dogs. What sized dogs can fit in this cage? The crate is available in three different sizes. It can fit everything small to extra large sized dogs. Some of the breeds that customers have mentioned in their reviews are Golden Retriever, Husky, Belgian Malinois, and Boxer. As long as your dog can comfortably stand in the crate with three to four inches headroom, it can fit easily into it. With over 90% positive reviews and priced at just under $130, this is the value-for-money addition to this list of 48-inch dog crates. You absolutely cannot go wrong with this indestructible kennel. Pets are smarter than you’d like to think and they hate being locked up, especially if they are not crate trained. So, a plastic or wire cage will mostly be destroyed. With an all-steel construction that is designed to withstand the jaws and claws of even the heaviest of dog breeds, the Walcut Heavy Duty Strong Metal Crate is one of the best strong dog cages in the market. What sized dogs can fit into this cage? The Walcut heavy duty dog cage is available in three different sizes. The largest sized crate is designed for pets lesser than 176 lbs. That should give you a good idea of the pets that will fit into the crate. Some of the dogs that customers have used the crate for, include Alaskan Malamute, Pit Bull, and Mastiff. Irrespective of whether you have a large sized dog that manages to break out of cages or just likes to chew at the welding, this metal crate keep them locked and secure. One of the sturdiest crates in our list of best heavy duty dog crates. It will stop any sly escape artist. Even the largest dogs, such as a 150-pound mastiff, won’t break out of this heavy duty kennel.